as new collectors, recently enriched by a stock market boom, started a frenzy of buying. 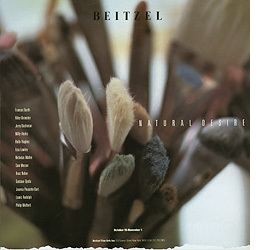 The commercial art scene was energized by the emergence of the Beitzel Gallery, founded by David Beitzel in the summer of 1986, with Barbara Petersen as his associate director. David was seeking a daring new approach to his graphics that would distinguish his premier galley at 113 Greene Street from the cacophony of his competitors and retained Design Latitudes to create a new direction, with an "Open eye towards the future," as Beitzel stated. We created an artful and innovative look and feel for the gallery employing neo-dada typographic letterforms with a painterly approach to photography.